The Dejero CuePoint return feed server sends low-latency video with audio, and teleprompting feeds to live broadcast production teams in the field to help them create compelling live content. 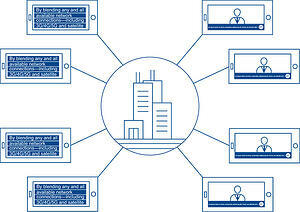 Return video and teleprompting feeds from the broadcast center can be seen in the field by the talent on a tablet or dedicated screen above or below the camera, or on multiple mobile devices by camera operators, field directors and technicians. We make it simple to scale the number of return feeds needed in the field. The high-performance CuePoint server delivers return feeds with as little as 250 milliseconds of latency to keep central production and remote teams synchronized. View return feeds simultaneously on multiple tablets or other mobile devices in the field instead of with dedicated decoders and bulky monitors. As with all Dejero solutions, we’ve designed the entire return feed workflow to be as simple as possible, in the broadcast center, and out in the field. Assign and manage return feeds from the broadcast center to the remote location from a web browser. No-matter where you are, Dejero Control puts you in control. Looking for a printable copy of the Dejero CuePoint product brief? Remote talent, field directors, and technicians can see when they are about to go live and what’s currently on-air. Camera operators can confirm remote feed is on-air and adjust camera framing to account for graphics, overlays, and split screens. Send teleprompter feeds to the on-air talent in the field, enabling real-time updates.